Garden Organic members can add Heritage Seed Library membership for just £18 a year. In addition to the benefits you receive as a Garden Organic member you will also receive the Heritage Seed Library Seed List. The Seed List is sent out annually in December, with a choice of up to six varieties and a seventh lucky dip variety. The Seed List does vary each year and for 2020 there will be a different selection of varieties. Please note that due to import restrictions we are unable to send seeds to countries outside the EU. Individuals living outside the EU are welcome to join the Heritage Seed Library to support this valuable work but will be unable to order seeds. 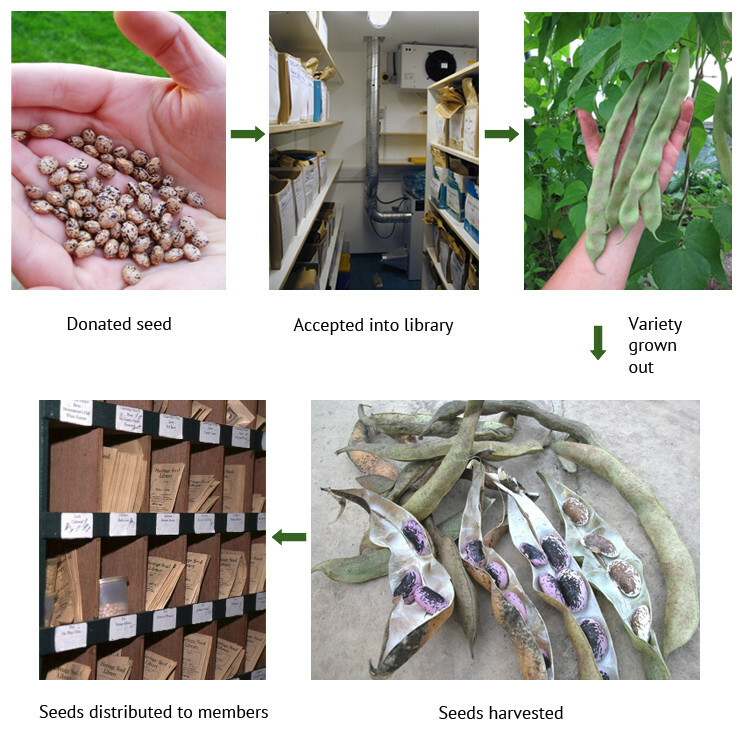 How does the Heritage Seed Library work? The seed library currently holds approximately 800 accessions of open-pollinated[^1] varieties. These varieties have been donated by HSL members or other members of the public, sourced through past HSL projects such as The Seed Search, or passed to us by seed companies who are no longer maintaining them. Each year, approximately 150 varieties within the collection are chosen for inclusion in the Heritage Seed Library Seed Catalogue. Subscribing HSL members receive the catalogue annually in December, from which they can choose six free packets of seeds. Seed from the chosen varieties is harvested from vegetables grown by Garden Organic's HSL team at Ryton Gardens and by Seed Guardians. These Guardians are HSL members who have decided to take on the extra responsibility of growing seed for us. They make an extremely important and highly valued contribution to our heritage work, supplying approximately half of the seed available for distribution each year. To find out more about the work of Seed Guardians and how you can become one, see Seed Guardians. What are the benefits of growing Heritage Seed Library seed? able to save your own seeds from one generation to the next, our open-pollinated varieties, unlike F1 hybrids[^2], will come true-to-type. You can explore the Garden Organic website for tips on growing organically and then get started with our heritage seeds after becoming a member! We also encourage you to save seed from the vegetables you grow for your own use. Advice on how to do this can be found in the Seed Saving Guidelines. Open pollinated These seeds will grow a variety that will breed ‘true to type’ from one generation to the next. The seeds produced will carry their parents’ genetic material and plants grown from them will bear their characteristics. Pollination can occur by vectors such as insect, wind or by hand. However, sometimes ‘cross pollination’ occurs. This is when pollen is transferred from one variety to another – from bees, for instance, visiting many different blooms. This can cause quite significant variations from the parent plant, particularly in brassicas or squashes. Peas and French beans generally do not cross-pollinate. It is worth noting that open pollinated varieties are inherently genetically variable, each plant being slightly different from every other plant, even if isolated from the pollen of another variety. This subtle variation enables adaptation. It allows the plant to respond to different growing conditions, and provides an all-important genetic diversity. F1 hybrid This is a variety deliberately created by crossing two different parent varieties. By combining their genetic material, the breeder creates a seed which inherits particular characteristics from the parent plants. 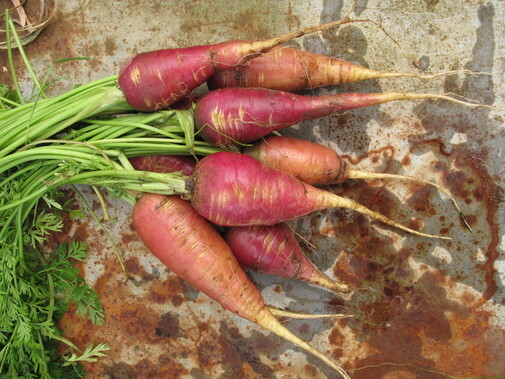 This could be disease resistance, for instance, or exceptional taste, size or colour. Pollination is done under strictly controlled conditions. F1 hybrid seeds often show vigour in growth. However, the seeds saved from F1 hybrid plants will not produce a plant with the same characteristics of the parent. The whole breeding process has to be done annually.